You'd love this house that overlooks a stunning river! It wouldn’t be the first time that we will feature a house that is located near the river or other bodies of water. We have just featured a home which overlooks the lake and it was indeed very beautiful. Indeed, when a home is near nature, it looks more beautiful and the owners will also feel even more relaxed while residing in it. Today, we are going to feature another house that faces a river. The Deschutes House is located on an urban site facing the Deschutes River in Bend, Oregon. 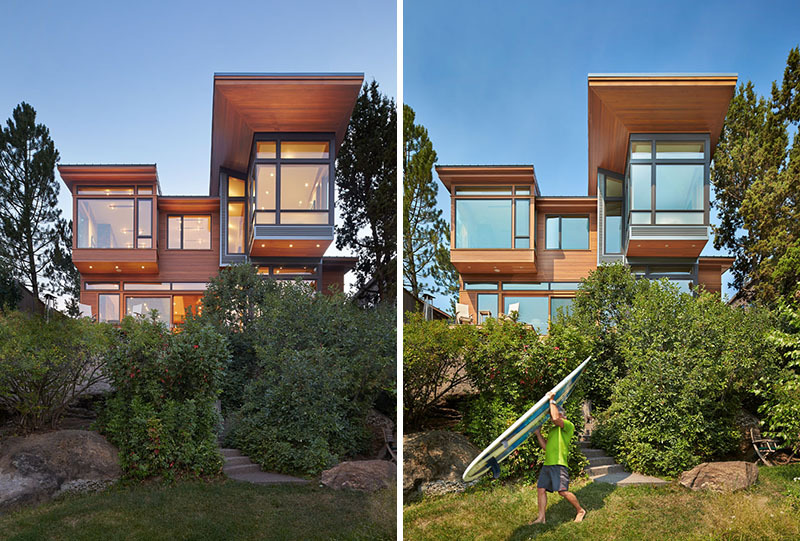 It also has a grassy courtyard with dramatic second story spaces that is cantilevered toward the river. Its main living space is completely transparent to the river on one side. On the other side is a courtyard. One can get two different views from each side of the house. 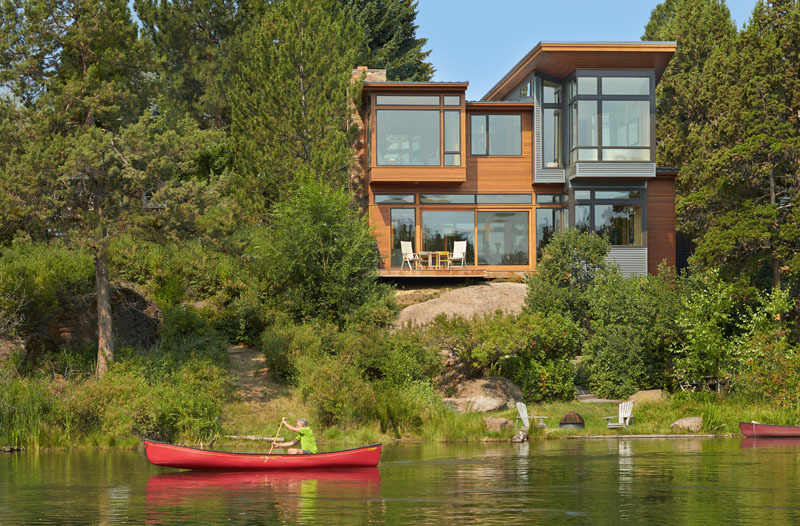 Its exterior is clad with two different types of siding: tightly spaced Western red cedar and corrugated metal siding. The warm tones of the wood are a nice contrast with the cool tones of the metal siding and metal roofing. 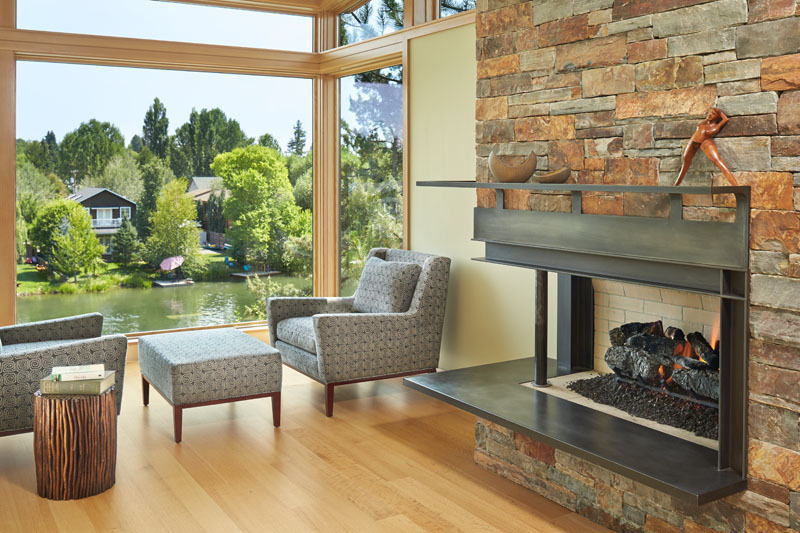 The fireplace chimney is clad in Montana ledge stone with a combination of earth tones and grey-blue colors. Let us take a look at the house below. Unique feature: The house is facing the river and made use of cedar and corrugated metal sidings for its exterior. Inside the house, it has a neat contemporary design with wooden features. 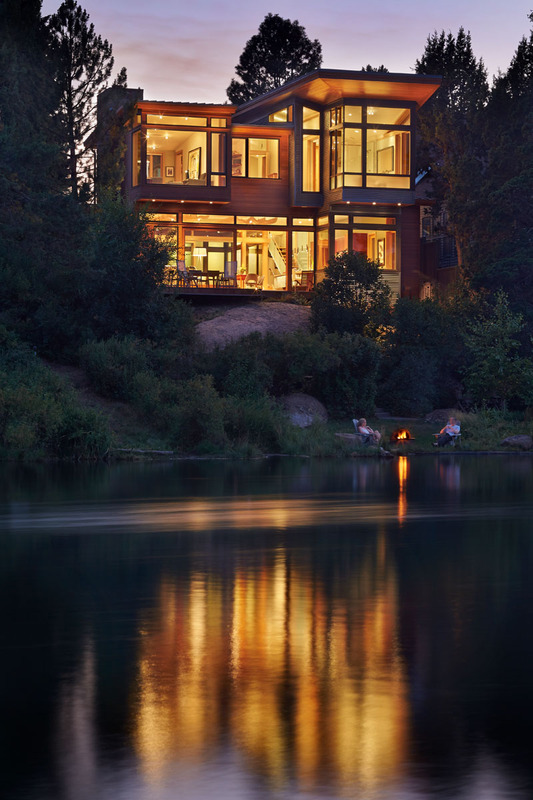 This new home which is designed by American architect Nils Finne of FINNE Architects, is perched above the Deschutes River in Bend, Oregon. As you can see, one can just go down from the house and access the river. It would also be very relaxing to take a look at the river while inside the house. The house is surrounded with trees and bushes which adds to its appeal and makes it even cozier and homier. The home has been covered in tightly spaced Western red cedar and corrugated metal siding. It also has a courtyard with a green lawn which can be easily accessed through a sliding door. You can see here the interior of the house because of the floor to ceiling windows used in it. The courtyard provides a quiet and contemplative space for the homeowners and it is also a nice contrast to the active river side of the house. If there are kids around, this could be a good place for them to play. 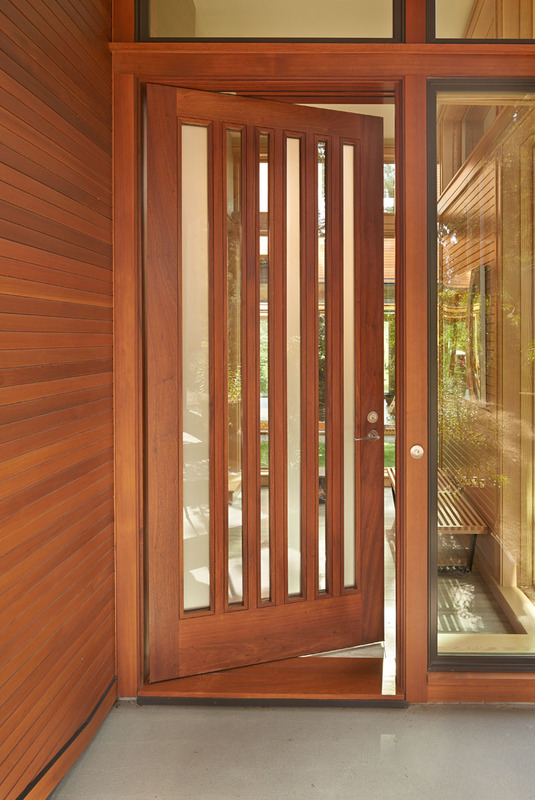 Welcoming you to the home is a wooden door that is designed with vertical glass inserts. This sure is a customized door which adds to the uniqueness of the dwelling. This is the living area with a tall shelf and a modern fireplace. 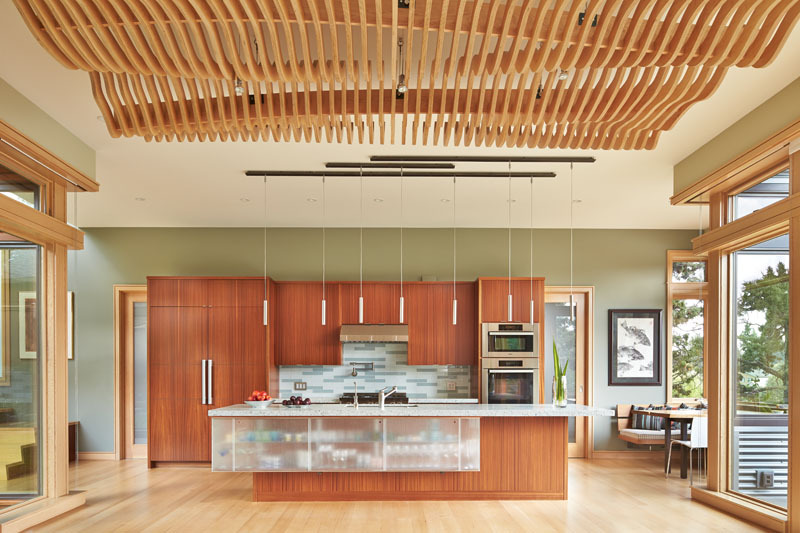 The living ceiling plane was enlivened by CNC-milled wood-strip ceiling panels, with variegated shapes inspired by landscape morphology. Totally distinct, right? 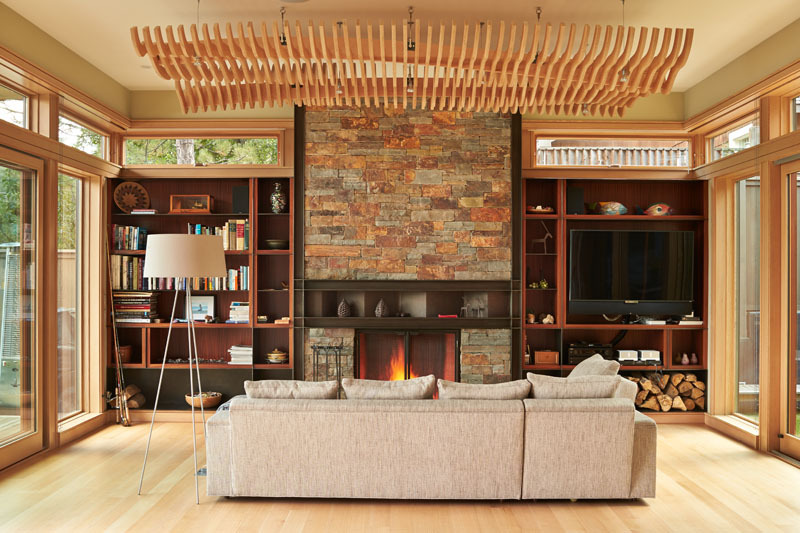 Two curvilinear wood ceiling panels are suspended from the ceiling of the living and dining areas. Each panel has 60 uniquely shaped wood slats (milled using CNC equipment), and are tightly spaced in order to create an abstracted river landscape. This is the kitchen of the house that used wood for its cabinets. 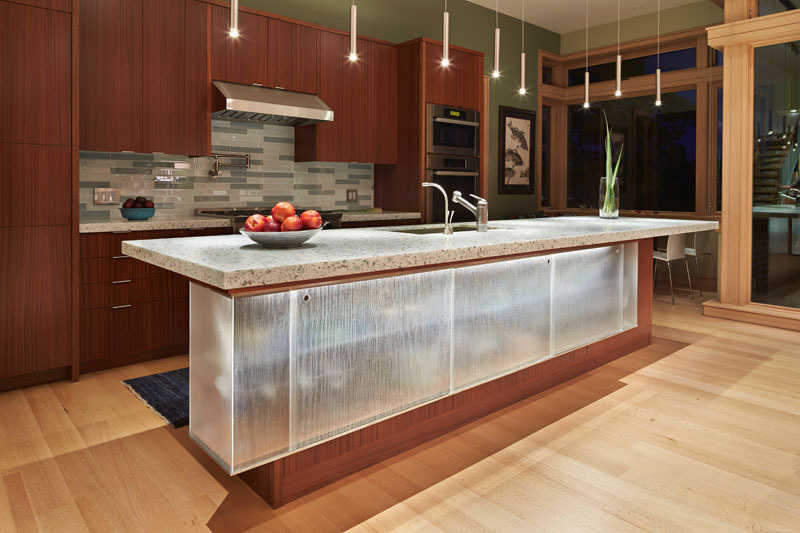 The island has a suspended glass cabinet with hidden LED lighting and it also has a marble countertop. 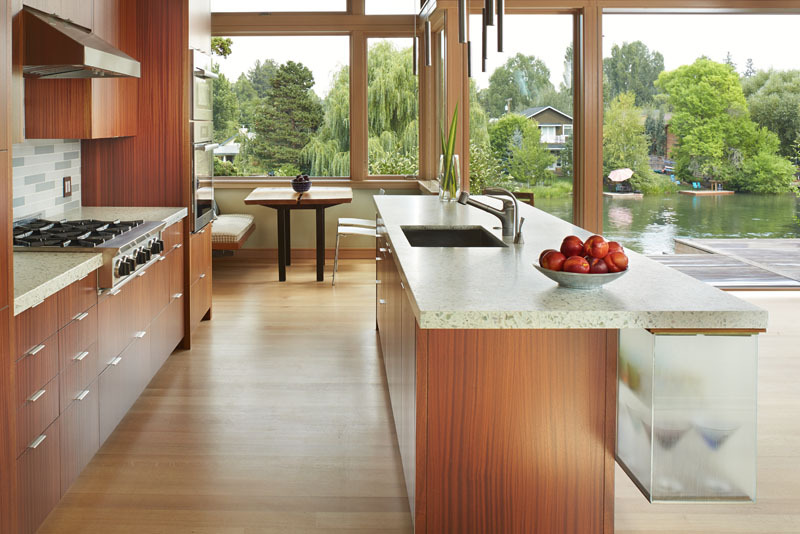 Like the living area, the kitchen also has many glass windows around it. Just off the kitchen, one can see a small breakfast nook with picture perfect views of the river. Here is a closer look of the small breakfast nook. It features a built-in hanging bench with two metal chairs on the other side. In the upper area, it has a master bedroom and study wherein one can also enjoy the spectacular river views. Seen here is the bedroom lounge and the fireplace that has a brick stone finish. The master bath cantilevers dramatically out toward the river. Because of this position, the freestanding tub visually floats over the river traffic. Seen here is the wooden floating vanity with a wide mirror on the wall. Imagine yourself bathing in that tub, it would really be nice to relax in there while watching the river! 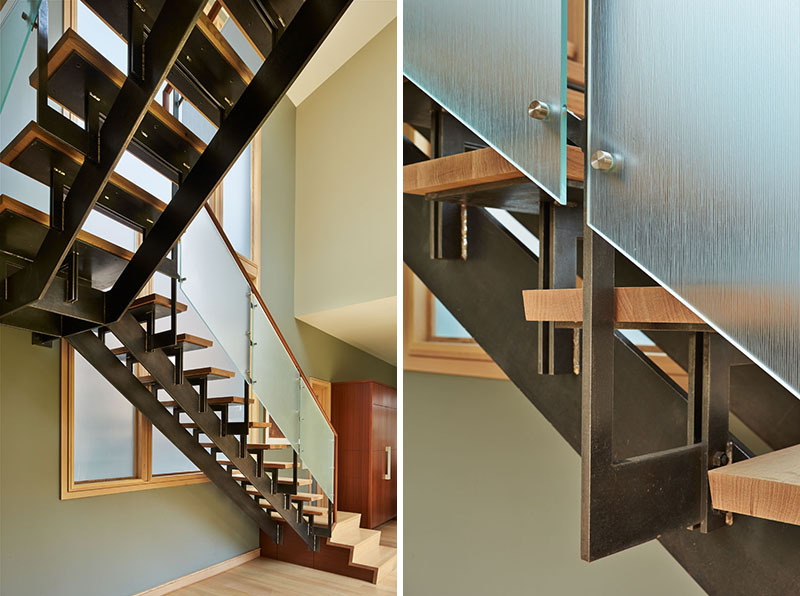 This is the staircase of the house which used a combination of steel, glass and wood. It connects the various floors of the home and it also appears like a giant sculptural element because of its usage of materials. During the night, the home lights are up like a lantern, giving emphasis to the beauty of the home. It looks really nice, right? Aside from its beautiful design, the house has a number of sustainable or green building features. 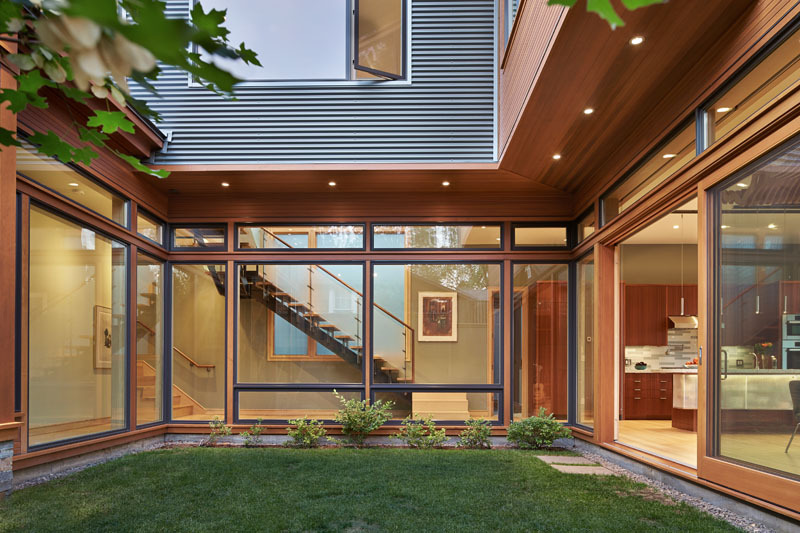 This includes a 2×8 construction (40% greater insulation value); generous glass areas to provide natural lighting and ventilation; large overhangs for sun and snow protection; metal siding for maximum durability; and radiant floor heating. The house is designed by FINNE Architects and apparently, the result is a gorgeous contemporary home. I like it that the house made use of wood in most of its areas from the exterior to the interior.